When it comes to food, we generally consider fresh food to be best. We relish fresh fruit and vegetables to the extent that Chazal (the Sages) decreed a special blessing of thanksgiving (“she’Hechiyanu”) when we first partake of the new crop each season. Fruit, vegetables, milk, and meat are very perishable, all the more so in the days before modern refrigeration. History is replete with innovations that allow food to be stored for long periods without spoiling. Some hearken back to the times of the Bible, when they often played a pivotal role in the vicissitudes of history. Noah fermented grape juice into wine, allowing his sons to demonstrate the characteristics that would mark them for eternity. Joseph succeeded in dominating the entire world by developing a system of preserving grain during the seven years of famine (see Rashi, Genesis 41:48). Yishai (Jesse) sent preserved milk in the form of rounds of cheese with David to provision the army against the Philistines (the first military “C rations”—or “MREs”! ), allowing David to be in the right place at the right time to slay Goliath. In modern times, NASA was able to put a man on the moon only after it developed “space food” for its astronauts. The means used to preserve food can result in entirely new foods (as in pickling, smoking, or sausage making) or in the maintenance of the original state of the food for a long period (such as in canning, freezing, and drying). Each process raises its own unique Kosher certification concerns. Our story begins about two hundred years ago with Napoleon Bonaparte’s famous dictum, “An army marches on its stomach.” Napoleon’s armies were in the process of conquering Europe, which entailed a lot of marching, and he needed a means of providing his French army with wholesome and palatable provisions. To this end, he offered a 12,000-franc prize to anyone who could develop a means of preserving food for the army and navy. A French chef named Nicholas Appert won this prize in 1809. Mssr. Appert spent fourteen years developing his new process, which he published under the title L’Art de conserver, pendant plusieurs années, toutes les substances animales et végétales (The Art of Preserving All Kinds of Animal and Vegetable Substances for Several Years). The process consisted of enclosing the food in hermetically sealed glass containers and heating it for a period of time. Although he did not understand how the process worked (this would wait until Louis Pasteur explained that the heat sterilized the product by killing the bacteria in the jar and thus preventing spoilage), Appert was nevertheless able to provision Napoleon’s army and begin the canning industry. In 1810, Peter Durand of England patented the use of tin-coated iron cans instead of bottles, forming the basis of the modern tin-coated steel cans used today. 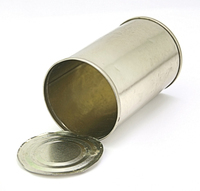 (The term “tin can” is a bit of misnomer because only an extremely thin layer of tin covers the steel to prevent rust.) It took more than a hundred years, however, for canning technology to provide a reliable and safe means of preserving food. Failure to adequately sterilize the contents of a can may allow microorganisms to grow and the food to spoil. Of even greater concern is the possibility of creating conditions that favor the growth of Clostridium botulinum or other microorganisms that can produce toxic, or even lethal, chemicals. Indeed, more American soldiers died from consuming American “embalmed beef” during the Spanish-American War than from Spanish bullets! Today, the government carefully regulates all aspects of the canning industry to ensure that the proper procedures are followed to ensure a safe product. The history of the process may be of only passing interest, but the Kashrus issues relating to it are extremely topical. In the last few years, you may have noticed that many vegetable products have begun displaying Kosher certification. The need for Kosher certification is based on the following concerns: Although vegetables grown outside Israel (where special rules of tithes apply) are considered inherently Kosher to begin with, they are often processed in equipment that is also used for non-Kosher items. Fresh vegetables are generally harvested at a specific—and for a short—period of time. For example, peas, corn, and string beans are available for canning for only several weeks, during which time the entire crop must be processed. The processing involves preparing the vegetables for canning (cleaning, sorting, and blanching in hot water to deactivate the enzymes found in the vegetables) and then preparing a brine, the liquid added to the vegetable to fill the can. The sealed cans are then sterilized in large pressure cookers (called retorts). Years ago, production facilities were designed for certain vegetables, and when the canning season for these vegetables ended, the plant was shut down. Nowadays, more and more companies find such a system to be economically inefficient and have devised uses for the plant during the “off-season.” Some plants process non-Kosher soups and sauces. Beans and chickpeas are also processed in the off-season because these are produced from dried beans and often include pork and beans, chili, and similar meat products. Tomatoes and tomato sauces are often processed in the same equipment used to make meat and cheese-flavored pizza sauces. Clearly, products coming from such canneries pose serious Kosher certification concerns. Canneries that process such non-Kosher products can compromise the Kosher status of otherwise Kosher items in the following ways: The brine used for vegetables can be cooked in the same kettles used for non-Kosher items. Even if the brine is Kosher, it may be used for non-Kosher production, come in contact with the non-Kosher product, and then recirculate through the brine system. The retorts used to sterilize non-Kosher products become non-Kosher, and the subsequent processing of otherwise Kosher vegetables would compromise their Kosher status. This is true despite the fact that the non-Kosher product is sealed in the can. The use of Pagum (foul-tasting) water in the retort, however, may allow for the interchangeable—or even concurrent—use of a retort for Kosher and non-Kosher products. Indeed, a chemical called BitrexTM (denatonium benzoate—the bitterest substance known) has been used successfully at very low levels to resolve this concern. Even if the facility maintains separate processing systems for Kosher and non-Kosher production, the condensate from steam used to heat the non-Kosher products is often returned to a common boiler and then used to cook the otherwise Kosher items. Depending on the system, hot water used to cook non-Kosher products can also be recycled and used to cook the otherwise Kosher items. Ensuring that cans of seemingly harmless vegetables are processed in the plant with a reliable Hashgacha is therefore imperative. Administering Kosher certification for a cannery raises concerns beyond the actual Kosher status of the equipment used. Some vegetables are subject to the rules of Bishul Akum, the requirement that they be cooked with the assistance of a Jewish person. For a food to be subject to concerns of Bishul Akum, it must exhibit two characteristics: (1) it is inedible raw; (2) it is an “important” food, generally defined as a food that would be served at an important banquet. Many vegetables, such as peas, green beans, and corn, are commonly eaten raw and are thus immune to this concern. Potatoes, on the other hand, are certainly inedible in their raw state and are generally considered an “important” food (traditionally defined as “fit for a king”). Asparagus poses an interesting question. Although it is clearly inedible in its raw state, canned asparagus—as opposed to its freshly cooked sibling—is far less appetizing and generally not considered an important food. The status of canned asparagus would, therefore, seem to be dependent on the question of whether the importance of the food depends on its type or the manner in which it is prepared. A further concern, common to both fresh and processed vegetables, stems from insect infestation. Insects are not Kosher, and vegetables that are prone to significant infestation may not be eaten unless inspected. Vegetables prone to this problem, such as Brussels sprouts, spinach, and cabbage (or sauerkraut), are not exempt by dint of the canning process, and productions of such products must typically be specially supervised. New processes for food preservation, however, are constantly being devised, often following the historic imperative of the need to feed an army. “Shelf-stable” foods, tasty meals packaged in plastic pouches and trays, are retorted in much the same manner as cans and similarly require no refrigeration. They are known in the armed services as “MRE”—meals ready to eat—and became famous during the Gulf War, where they fed the allied soldiers. What is also interesting is that Kosher certified MREs were made available to Jewish soldiers for the first time, and updated versions of these new Kosher meals are currently being sold to make traveling easier and tastier for the Kosher public. Tin cans may have evolved into MREs, but the concerns relating to preserving food and keeping it Kosher always pose fresh problems that need to be resolved. Modern vegetable canneries often process a variety of products, including non-Kosher items. These products commonly include pork and beans and tomato products containing meat and cheese. Although virtually all vegetables are inherently Kosher, their otherwise Kosher status could be compromised if canned in a factory that also processes non-Kosher products. The canning process involves sealing food in an airtight container, such as metal or glass, and heating it to kill microorganisms that would otherwise cause the food to spoil. Failure to sterilize the contents of the can properly allow for the production of potentially lethal toxins such as botulism. To achieve the temperatures necessary to sterilize the product, cans are heated in steam-pressurized vessels known as retorts (or autoclaves). Additional Kosher certification concerns in such facilities include the recirculation of steam condensate from non-Kosher productions, as well as the common use of sauce kettles for both Kosher and non-Kosher products. Steam may also be contaminated when recirculated from non-Kosher productions. Many vegetables, such as spinach and cabbage, are subject to significant insect infestation. Such vegetables usually require special supervision to ensure that the product being canned is insect free. Certain vegetables are inedible in their raw state and may therefore be subject to the rules of Bishul Akum. Potatoes are generally assumed to be subject to such concerns, although canned asparagus may be exempt because the canned version may not be considered an “important” food. Canned goods are often packaged and stored without labels, allowing for companies to purchase and affix their own labels at a subsequent time. Even brand-name manufacturers that operate their own factories may purchase some material from outside vendors. Consequently, one cannot assume that a brand-name vegetable is produced by that company. Supervision agencies must pay particular attention to these issues when certifying canned goods. Shelf-stable products, such as MREs, are processed in much the same manner as canned products and share similar Kosher certification concerns.